In this chapter, first I will briefly describe the molecular properties of titin and nebulin — two extremely large, myofibrillar proteins -- and discuss their distribution and organization in the sarcomere. Although these novel proteins are major myofibrillar components of a wide range of striated muscles, they have escaped the attention of muscle biochemists until very recently. As I shall point out below, biochemical studies of these proteins have been unexpectedly challenging: many standard techniques had to be modified before they became capable of handling such giant proteins. In addition, our structural studies of these proteins have encountered a challange of a different nature: how to explain their distribution in the sarcomere according to the currently accepted two filament sarcomere model, because these proteins do not appear to be thick or thin filament-associated regulatory or anchoring proteins. 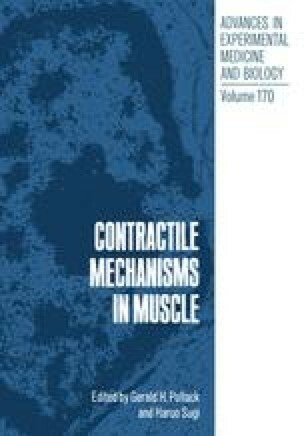 These studies have led us to reexamine the question of whether continuous, longitudinal filaments exist within the sarcomere of striated muscle. I will attempt to integrate our results, as well as available literature data, within the framework of a hypothetical sarcomere model which incorporates an elastic filamentous matrix consisting of titin and nebulin as additional sarcomere constituents. Finally, I will very briefly mention our recent findings that an extensive three dimensional network of intermediate (10 nm) filaments, distinct from titin and nebulin, is intimately associated with the sarcomere of adult striated muscle.